SAN DIEGO — A cleanup effort has been renewed at the former A-8 public anchorage site in San Diego Bay, as the San Diego Board of Port Commissioners accepted a grant of $120,000 in additional funds from the National Oceanic and Atmospheric Administration (NOAA) to remove marine debris from the site. The effort is just the latest in the port’s ongoing process to clean up the former free long-term anchorage site in central San Diego Bay. A-8 was closed by the port in 2008. At that time, the decision to close down the anchorage was said to be due, in part, to the number of derelict vessels the site had attracted. Port officials said many of those boats turned into sinking vessels, resulting in unwanted marine debris and environmental problems. In its heyday, the A-8 anchorage accommodated up to 150 vessels at one time in the bay, acting as a home for liveaboards and a long-term vessel storage area. After the port’s decision to close the anchorage, boats that were abandoned there were removed. 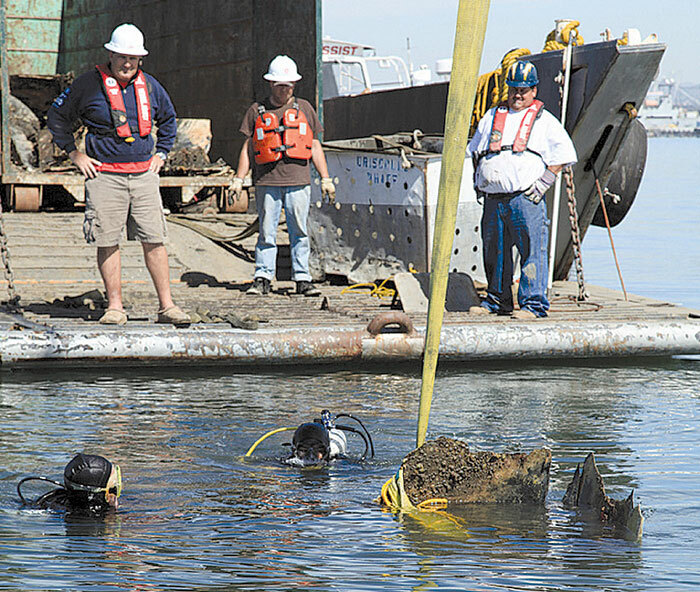 An extensive underwater cleanup of the anchorage was undertaken by the San Diego Unified Port District, NOAA, the California Regional Water Quality Control Board and volunteers to remove 75 sunken vessels and more than 700 pieces of marine debris — including batteries, anchors, tires and bathtubs. The project was completed in 2010, removing more than 175 tons of debris from the bay floor. However, following a 2011 eelgrass survey of the bay, side-scan sonar imaging of A-8 anchorage and its surrounding area identified 945 items of debris still on the bottom and in need of removal. The side-scan sonar showed 536 items of debris smaller than 3.28 feet in size, 309 items ranging between 3.28 and 9.84 feet in size (including two objects identified as vessels) and 100 items larger than 9.84 feet — seven of which were identified as sunken vessels. The grant fund award comes from NOAA’s National Marine Fisheries Service, under the Community Based Marine Debris Prevention and Removal Project Grant. San Diego’s Board of Port Commissioners is expected to review the project in early 2013 to select a contractor to conduct the underwater dive and crane operations needed to remove the debris. According to NOAA’s grant specifications, the project must be completed by Sept. 30, 2013 or the funding will expire. An additional $50,000 is expected to be used for the project, from the port’s Environmental Fund. In addition to the funded projects, a volunteer cleanup operation took place at the former A-8 anchorage area on Aug. 25, as part of San Diego’s Operation Clean Sweep. Military divers dove off the shore of Pepper Park in National City, working to remove debris from the old A-8 Anchorage. The team worked with remote operated vehicle (ROV) manufacturer SeaBotix and the San Diego Port Tenants Association (SDPTA) to retrieve objects from the bay floor. So far, $350,000 has been put toward cleanup of the anchorage site. Last January, the Port of San Diego requested an additional $99,500 from the San Diego Water Board’s Cleanup and Abatement account to help with removal of the recently surveyed marine debris, and it was awarded a grant on Aug. 8. That $99,500 will be added to the NOAA grant funds and the port’s Environmental Fund total of $170,000 for the upcoming project.